If you are using servers in the cloud for your current and future new products and innovations, you are wasting money, creating risk, building technical debt that you are gonna have to change and transform in the next 12 to 24 months. As a digital strategist, you have to look at what will benefit and be of the greatest customer experience possible, with the lowest costs and the highest ability to iterate and develop new solutions to test to the market. We no longer need to build something for longer periods of time, and then release it in the market. We instead have the potential and the capacity and the capability, when we leverage current technologies on the cloud and Amazon or Azure. We get the benefit of speed … speed in variability and product delivery, speed in the scale of features, speed in the ability to test A/B testing across different demographics, across different platforms. We have gained speed. Now, when you have speed and you combine that with your marketplace innovation, vision, and execution with the customer in mind, you can create outstanding high impact solutions. You cannot do that based on the old model of classic virtual machines or forklifting machines from your data center into a cloud environment. One, you’ll lose the benefits of cloud. You’ll lose the features and the functions. You’ll lose the analytics and the integration that can occur. But you also have high cost … higher regulatory, higher compliance cost and higher maintenance cost. Let’s be practical here, what is the upside and potential metrics you should expect with this shift in mindset and execution. Out of the gate, when you move to the cloud, you no longer have to worry about provisioning servers. You do no longer have to wait the hours or days for an IT department to spin up and build that perfect image. It’s no longer required. Instead, you have your cloud team create automation scripts that yes, configure these deployed resources in the cloud to match IT’s good practices. These good practices include management of deployed resources. It allows you to initiate at the get, transparency and chain of custody of these systems and operations. It allows you to instill certain privacy and cyber security and regulatory concepts baked in. Done in such a way that as you roll out these resources you allow your engineers to iterate and be creative, giving them the freedom to execute without hard walls. 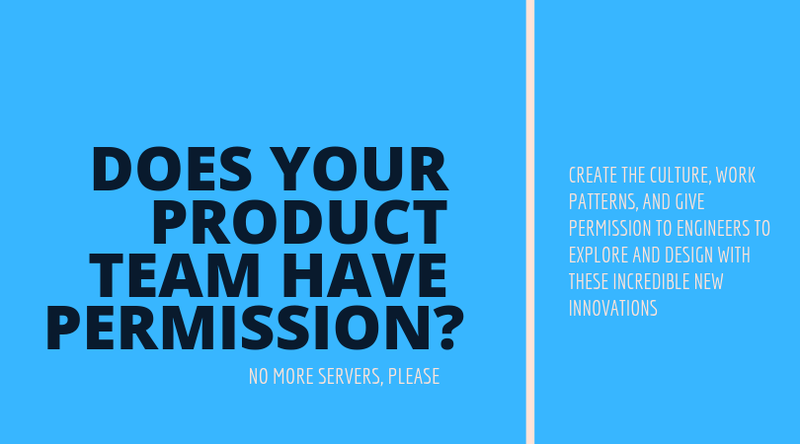 By providing freedom outside of the old known tech, you allow engineers to explore the new tech, the edge and fringe feature sets from our cloud service providers — where true innovation can begin. By creating that speed, that trust, the transparency and the operation execution, we are then able to outpace number one, our customers expectations, but perhaps even delight and surprise our customers by bringing forth innovations, Alexa integrations and other things to the market before they even have the concept that they needed it. Virtual machines make sense in some categories of work, but for new products, what you’re looking at, what you’re building, where you are moving — create the culture, work patterns, and GIVE permission to engineers to explore and design with these incredible new innovations. Set your teams up to innovate and succeed and you will see true success in the market for your efforts.